As each school embarks upon its own unique journey, we conduct a readiness assessment which identifies opportunities and focus areas. From there, we make basic adjustments to our core training, and identify the best approach to mentoring. Training begins with the teacher: an intense, transformative immersion on how to personally internalize the mindsets, as well as how to facilitate learning and apply them in everyday academics. School leadership is trained on program implementation and best practices to ensure maximum fidelity, while teachers receive guidance on specific strategies for applying and activating the 7 Mindsets with their students and personally. In many cases, the best training is a completely customized experience, which we create to suit 1/2-day, 1 and 2-day agendas. The work of social emotional learning requires focus, persistence, and a plan that adapts to each community's unique vision. In most cases, it requires a cultural transformation. This unique event goes beyond SEL to address the best practices we find are necessary at the leadership level to affect lasting change. With tracks for teachers, administrators and community leaders, participants leave prepared to guide their own communities through the changes. 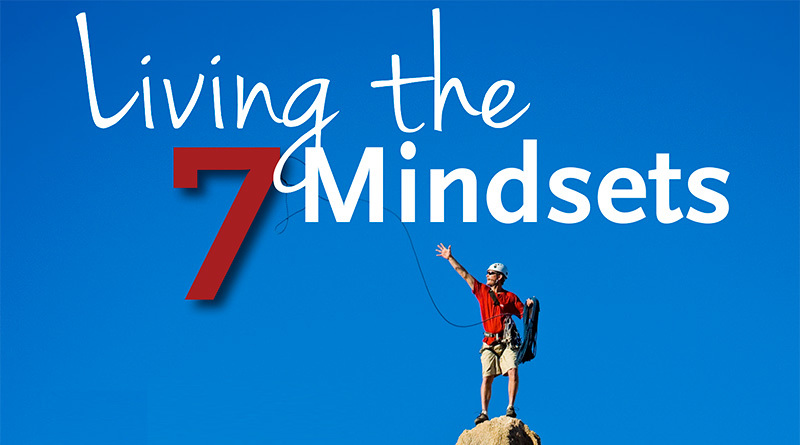 7 Mindsets Teacher Training is a live, on-site training that focuses on each participant's personal development around the 7 Mindsets. Topics covered include how social and emotional learning is a foundation for personal and academic success and the reason “why” we chose teaching as our profession. We will also show examples of how this framework is used in schools across the country in terms of implementation and common language. This solution is also adaptive to various types of learners, through a combination of audio, visual, kinesthetic, conversational, written and service learning-based lesson and activity formats. Teachers can further personalize the experience to accommodate their students’ leadership propensity through customizing the lessons and service learning projects. 7 Mindsets offers fully customized, extended trainings which begin with our standard 1/2-day training, but expanded to meet the unique needs of your school, based on your readiness assessment results. The Ultimate Life Summit (ULS) is a life-changing adventure that empowers students to begin living to their full potential. For five days each summer, 100 young people from across the country and around the world convene in Atlanta to learn the 7 Mindsets that lead to lives filled with passion, happiness, and extraordinary success. Schools and community organizations that subscribe to our Classroom Portal also receive access to the 7 Mindsets MasterClass, our self-paced, video-driven personalized adult learning program that enhances their ability to maximize the positive impact of the 7 Mindsets with their students.